Brad Davis, left, and Clint Dempsey of the United States Men’s National Team during a training session at the Sao Paulo FC training center in Sao Paulo, Brazil. The United States kicks off its 2014 World Cup campaign on Monday against Ghana, the team that eliminated the Stars and Stripes from the 2010 tournament in the round of 16. That’s the must-watch game in the U.S. But for most of the rest of the world, it’s Germany versus Portugal. So what’s changed for Ghana and the U.S. since they last faced each other on this stage? Klinsmann made clear his preference for a fresh group during the selection process, and — Donovan’s ouster aside — that’s not a bad thing. New faces since 2010, including Fabian Johnson and Geoff Cameron, have acquitted themselves reasonably well for clubs in Europe, a factor Klinsmann values highly. Graham Zusi, Brad Davis and Matt Besler are playing effectively in MLS. The cupboard isn’t quite as bare as is widely believed, though the U.S. is still far from elite in the talent department. Most members of that group are plying their trade in top European leagues, so Ghana’s high-end talent is probably superior to that of the United States. But Ghana’s edge in talent hasn’t always translated in international play. It ranked just 38th in the pre-World Cup Elo Ratings, while the Americans ranked 13th. When ESPN’s Soccer Power Index (SPI) ranks teams, it attempts to combine these two elements — observed results and underlying talent — into a single rating for a given national team. And the current SPI rankings say the United States and Ghana are in a dead heat. The U.S. ranks 22nd in the world with a 77.53 SPI — meaning the Americans would compile 77.53 percent of the possible points if they played a round robin against every other national team in the world. Ghana ranks 25th, with an SPI of 77.37. That’s the smallest SPI margin between any two teams that will face each other in the group stage of this World Cup. As of Sunday, the sportsbook Bovada has Ghana as a slim favorite over the U.S., 35.8 percent to 34.5 percent (with a 29.7 percent chance of a draw). The FiveThirtyEight match projection system flips those odds around, giving the United States a very slight edge: 37.5 percent to 33 percent. 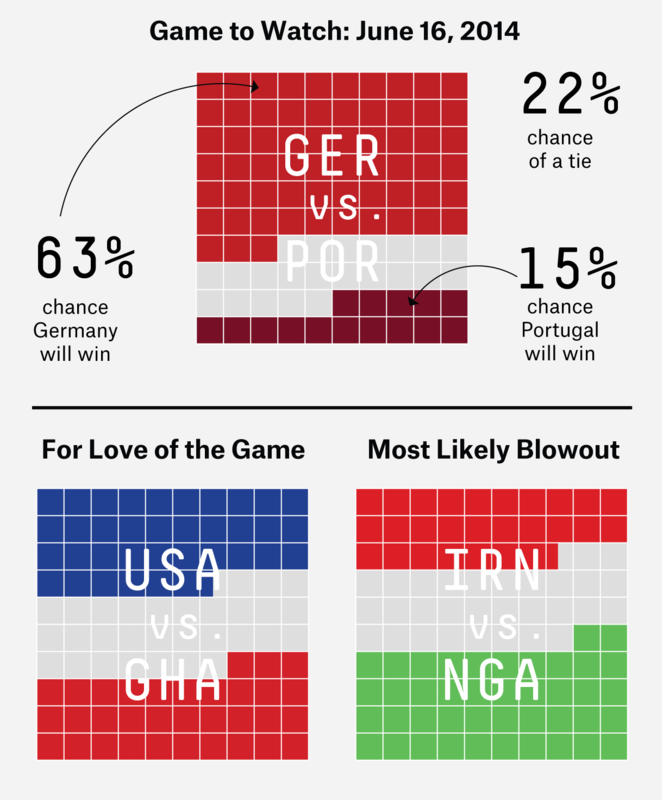 Whatever happens, U.S.-Ghana should be one of the most evenly matched showdowns of the entire World Cup. Argentina’s 2-1 win over Bosnia-Herzegovina on Sunday served notice to the casual soccer fan: One individual moment of brilliance can overshadow an average game. In the first 64 minutes of the match, Argentina’s Lionel Messi was the game’s most active participant in the attacking third, but the three chances he created didn’t translate into a single shot on goal. And he had turned the ball over a game-high three times. In the 65th minute, Messi reminded the Maracana how quickly he can change a game. He made a run from the midfield, past Bosnian midfielder Muhamed Besic, and played a quick 1-2 ball to teammate Gonzalo Higuain. Messi’s short-burst quickness created separation from Besic, and he hesitated slightly before the shot, driving another Bosnian player into Besic and out of position. Messi then banked a left-footed shot off the post for the eventual game-winning goal, Argentina’s first shot on goal of the match and only the second goal of Messi’s World Cup career. From his first touch in midfield to the ball crossing the goal line, the entire sequence took just over 9.5 seconds and erased the match’s first 64 minutes from spectators’ memory. If Ghana defeats the United States on Monday, Americans shouldn’t be too quick to feel ill-disposed toward the West African nation. The United States imports two bread-and-butter items from Ghana (though they are neither bread nor butter): oil and chocolate. In 2011, just more than 44 percent of Ghanaian exports to the United States was oil (crude and refined) and roughly 42 percent was chocolate (cocoa beans, chocolate, cocoa powder, cocoa paste and cocoa butter). That’s $374,624,626 in chocolate. Ghana also sent $7,016,768 in fake hair to the U.S. Thanks, Ghana!